Pearl Izumi's Quest Jersey blends classic styling with the company's latest fabric technology for a smart-looking and just-plain-smart jersey that'll go the distance. Select Transfer fabric is not only comfortable and durable, but also wicks moisture to keep you dry and comfortable during hard efforts. The 13.5" hidden front zipper allows for customized ventilation. Three rear pockets hold your necessities. Reflective elements help keep you visible. Fabric is 80% Polyester, 20% Lycra. Semi-form fit. 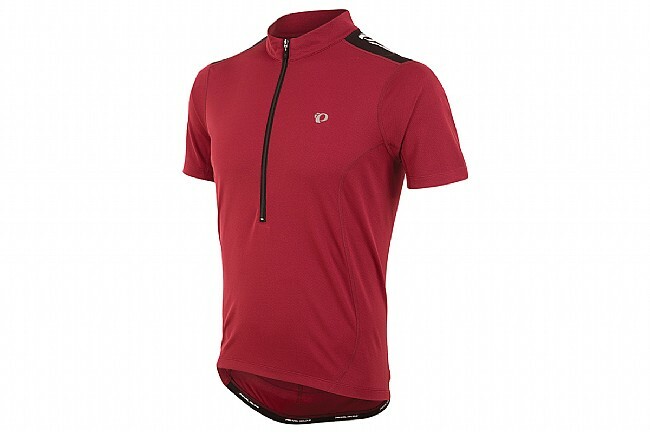 Pearl Izumi clothing is well made and well fitting. Good value for the price. Great jersey for all riding styles and body types! Fits like traditional polo shirts and is neither too tight or loose on the bike. The lighter colors work great in the heat. I'll continue to buy them. My biggest issue with cycling apparel is sizing. I'm a bigger guy (250 lbs) and have a hard time finding the size I need. Pearl Izumi always comes through. I got theXXL and it fits snug but comfortable and not baggy either. Perfect. Other brands have XXL sizes but are still way too small. I like jersey but I did not receive the one pictured. No black up the sides and it has a silver insert at the top of each shoulder. Its still is nice but not the one I wanted. To bad if it did look like the picture I would buy more. Nice fit, good quality, looks decent, nice. So far so good, decent jersey for the $ and typical PI qualitystyle. This jersey is great for training and commuting. Not an overly tight team kit jersey, more of a T-shirt jersey feel. Looks sharp with a pair of jeans though if you ever need to skip changing shirts. Fits somewhere between race and club cut. Quite comfortable and breathes well. Great training jersey for the price. Fabric is high quality and durable as usual for Pearl Izumi. I am very happy with this jersey.